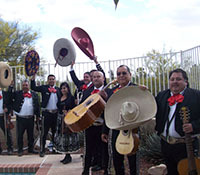 This fun loving large Mariachi band will excite your guests and get them singing along to the musical favorites of Mexico. You will be charmed with their exhilarating sound and memorable performance. Perfect for a party, wedding or corporate event.